Victor Hugo: Les Misérables – From Page to Stage, a world-first exhibition and the biggest ever staged by the State Library of Victoria, is now open. The exhibition explores the 19th century origins of Victor Hugo’s greatest novel Les Misérables and examines his fascinating life and enduring influence as a writer, artist and political activist. 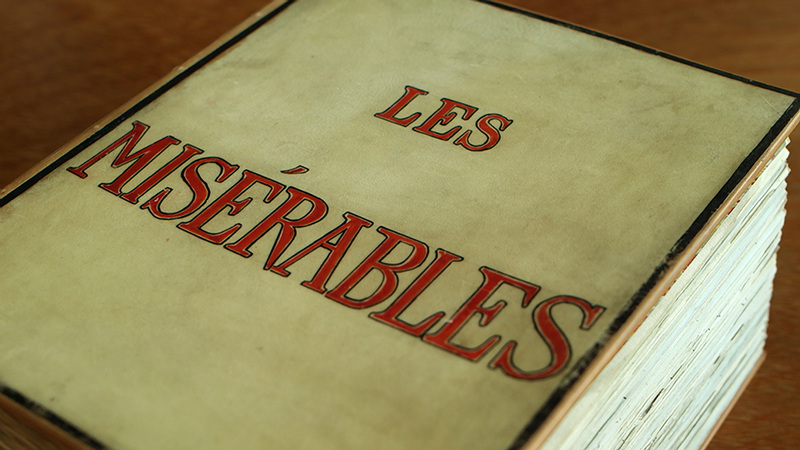 With remarkable loans from the Maison de Victor Hugo in Paris and Guernsey, the Bibliothèque nationale de France, the Musee Rodin and, for the first time, material from the Cameron Mackintosh archives, the exhibition is of world significance for lovers of Les Misérables. Victor Hugo’s original 1862 manuscript of Les Misérables is an exhibition highlight. The 945 page volume is a national treasure of France and a prized item in the Biblioteque Nationale de France collections. This is its first showing outside Europe. Since its publication in 1862 Les Misérables has sold countless copies, been translated into 20 languages, adapted for cinema at least 50 times, and has inspired 3 major musical theatre productions. This exhibition explores the events that led to the story’s creation and how it has remained part of the popular consciousness for over 150 years. Victor Hugo: Les Misérables – From Page to Stage coincides with the Australian premier of Cameron Mackintosh’s stage production of Boublil and Schönberg’s Les Misérables now showing at Her Majesty’s Theatre, Melbourne. Les Misérables is one of the most popular musicals of all time, seen by over 65 million people worldwide. The exhibition goes behind the scenes of the musical with displays of original stage props, costumes and designs as well as interviews from composers, performers and costume and set makers. A selection of the costumes from the production are available for visitors to wear as they take to the stage for their own star performance. A series of public events and schools programs complement the exhibition. Victor Hugo: Les Misérables – From Page to Stage is developed and presented by the State Library of Victoria and exclusive to Melbourne. I am interested in seeing the original Les Miserables transcript. Could you please tell me how? Where? and is there a fee?